Raaga.com: Shah Rukh Khan too in race to exploit the Eid festival this year! Shah Rukh Khan too in race to exploit the Eid festival this year! Readers may wonder how Shah Rukh Khan could exploit the Eid festival this year because both his movies FAN and RAEES are still in pipeline. Well hold on…. ‘Clever’ Badshah Khan in order to bank the popularity of Eid festival and the mass hysteria of superstar Salman Khan has released his forthcoming film RAEES teaser along with Salman Khan’s BAJRANGI BHAIJAAN. Thus if you watch BAJRANGI BHAIJAAN, you will treat to double bonanza that of Salman bhai’s hit film and the mesmerizing teaser of SRK’s RAEES. 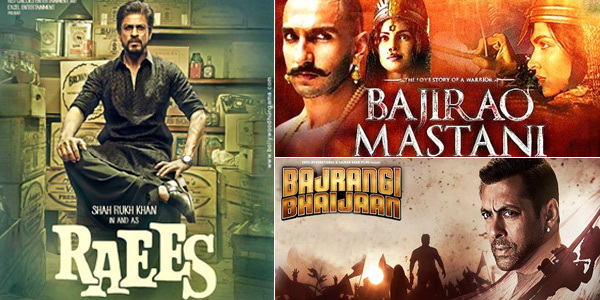 Interesting it’s not only Shah Rukh, who is exploiting the benefits of Eid festival and Salman Khan’s film BAJRANGI BHAIJAAN, even celebrated filmmaker Sanjay Leela Bhansali wished to attach his film BAJIRAO MASTANI’s trailer along with BAJRANGI BHAIJAAN but Salman turned down their aspirations as he has decided to promote the trailer of his own home production HERO instead, staring debutant Sooraj Pancholi and Athiya Shetty. Nevertheless Sanjay Leela Bhansali has not given up the golden opportunity. He has gone ahead and has separately released BAJIRAO MASTANI’s trailer in all cinema halls this Friday. It may be noted that the Muslim festival of Eid is known for attracting great business, particularly to Indian Film Industry as during the holy month of Ramzan, the Muslims abstain from watching movies. Thus on Eid festival they dash to cinema halls as a hungry lion pounces upon its prey. Hence it is now wonder filmmaker try to exploit the festival to it maximum.